(Phys.org)—A professor of structural biology and an informatics researcher have together written a paper outlining age bias in grant offerings by the National Institutes of Health over the past several decades. They show how older principal investigators (PIs) have traditionally been given more grants but note that new initiatives by NIH appear to be having a positive impact. Michael and Jonathan Levitt, who happen to be brothers, have published their work in Proceedings of the National Academy of Sciences. It has been a well-known issue in the science community for quite some time that older PIs have a better chance of getting a grant from the NIH than younger people. 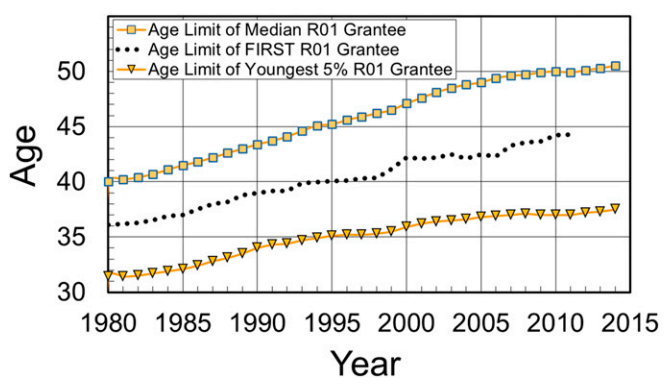 In their paper, the Levitts outline a trend that showed PIs under age 46 receiving fewer grants since 1982, while those for PIs over 55 received more of them—specifically, they found that the median age of PIs over the years 1980 to 2010 rose from 40 to 50. The bias is due to the way NIH awards grants, the authors note—committees are created to make assessments and award grants, but the members are made up of NIH grantees, which are heavily skewed toward older baby boomers. Older scientists, they suggest, find it difficult to award work to people they view as young and inexperienced. The authors note that things have been changing. In 2008, NIH initiated the Early Stage Investigator Policy solely to address age bias in awarding grants. And in 2016, the institute launched the Maximizing Investigator's Research Award. And just last year, NIH officials announced plans to set a cap limit on the number of grants a single PI can hold at one time. As the authors note, it is still too early to tell how much of an impact the moves by NIH will have, but early signs suggest a reduced rate of increase in grants to older PIs, while the numbers granted to younger PIs has been rising. They suggest that additional efforts be made (such as dedicating more resources to transitional postdoctoral fellowships that are awarded by NIH) to encourage young people to enter the science field, noting that most Nobel laureates did their prize-winning work before the age of 40. Educational bias is also a major problem: there is definite favoritism in awarding grants to Principal Investigators that have more experience and training. Very few grants go to those with High School credentials, and even fewer to investigators discriminated against because of cardiac problems (undetectable heart rate).